SPaul note: After two years of the Party of No assisting not at all, the economy has improved, jobs are back below the 450k mark and things are looking up again in America. Now, the Republicans are saying they will "get to work" to improve the economy...WHAT? WASHINGTON (Reuters) - Republicans took power in the House of Representatives on Wednesday with promises of a leaner, more accountable government but softened a pledge of deep and immediate spending cuts that helped them win November's election. The Republican takeover sets up potentially fierce battles in the coming months with President Barack Obama and his fellow Democrats on spending, debt and healthcare. 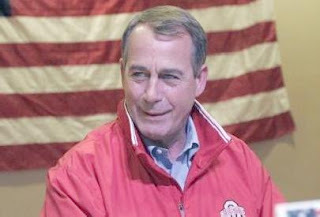 Republican John Boehner, from a working class Ohio family of 12 children, was elected House speaker in the new Congress and warned of "hard work and tough decisions" on the economy as the United States recovers slowly from its worst recession since the 1930s. "No longer can we fall short. No longer can we kick the can down the road. The people voted to end business as usual, and today we begin carrying out their instructions," Boehner said after taking over from Democrat Nancy Pelosi. Despite the tough rhetoric, Republicans signaled they could work with Obama to avert a debt crisis in the coming months. Republican control of the House and a larger minority in the Senate ushers in a new era of divided government after election gains spurred in part by high unemployment and the large $1.3 trillion deficit. But Obama's Democrats still control the Senate and can block the Republican agenda, which includes a plan to repeal the president's landmark healthcare reform and a roll back a crackdown on Wall Street. The incoming House budget chief, Republican Paul Ryan, told NBC's "Today" program a Republican campaign promise to cut $100 billion in spending this year had been "compromised" by the momentum of spending already under way. Republicans, under pressure from the fiscally conservative Tea Party movement that supported many of the party's candidates, promised to reduce federal spending to 2008 levels, which would trim $100 billion from the budget Obama proposed last year. But aides said the actual cuts are likely to be less than half that amount because the fiscal year will be half over by the time Republicans get a chance to affect spending in March. A deal on taxes in December showed Obama and the opposition can work together but there are many thorny issues ahead. Bond markets fear political gridlock could prevent Congress from raising the level of debt the country can take on, potentially making the United States default on its debt. Bill Gross, manager of the world's largest bond fund, warned that "mindless" U.S. deficit spending could result in higher inflation, a weaker dollar and the eventual loss of America's top-notch credit rating. "The problem is that politicians and citizens alike have no clear vision of the costs of a seemingly perpetual trillion dollar annual deficit," said Gross, who oversees the $256 billion PIMCO Total Return Fund. "As long as the stock market pulsates upward and job growth continues, there is an abiding conviction that all is well and that 'old normal' norms have returned. Not likely." Ryan, the incoming House budget chief, said he will seek spending concessions from the Obama administration in exchange for any increase in the national debt ceiling. "I'm not interested in raising the debt ceiling on the hope that a promise will be fulfilled at a later time," Ryan told MSNBC. "I'm only interested in raising the debt ceiling if we get concessions on spending, on real controls to get our fiscal situation turned around and headed in the right direction." Ryan's comments suggested Republicans are willing to work with Obama on raising the debt level but fights could still break out before the issue comes to a head in March or April. At the White House, spokesman Robert Gibbs urged Republicans to approach the debt limit vote "in a way that's responsible and in a way that doesn't threaten the full faith and credit of our government. The No. 2 House Republican, Eric Cantor, said the party was not backing down from its pledge to cut spending but had to wrestle with a temporary resolution to fund the government that sets spending at 2010 levels until March 4. "We've got this sort of gap period that we're operating in now to take care of the next fiscal year," he told the National Journal. "So it is just sort of a formulaic challenge." The two parties are headed for their first big clash next week, when Republican House leaders plan a vote on repealing Obama's healthcare overhaul. The effort looks doomed in the Democratic-led Senate but the vote could set the tone for a combative first few months. Pelosi told the opening session of the new Congress that "our most important job is to fight for American jobs." Obama will offer his own vision in the coming weeks when he makes a State of the Union speech to Congress and unveils a new budget. He could propose some form of tax reform as a way to reach a major deal with Republicans.